One of the 170 remaining CTA-owned bus shelters at 2650 W. Montrose Ave.
A JCDecaux shelter on Wacker Drive in 2010 shows the potential for advertising space. 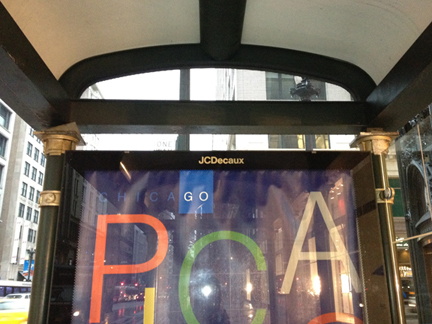 A JCDecaux bus shelter at State St. and Washington St. Note the large advertisement and metallic-banded columns. When Jen Masengarb submitted her question about bus shelters, she had some solid background on the matter. 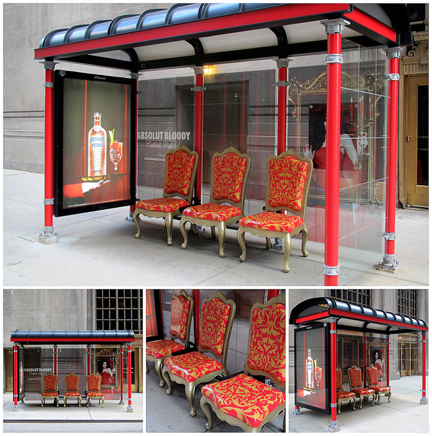 A historian and educator at the Chicago Architecture Foundation, she knew that JCDecaux, a French outdoor advertising company, won the contract with the city some years ago to install new bus shelters - or street furniture, as they’re called. Jen pointed to the shelters at 2650 West Montrose Ave., and another on California Ave., between Roscoe St. and Addison St., as examples. Turns out there are about 170 of these older shelters around the city, and that number will keep declining until there are none. Let’s flash back to November 2001. That’s when JCDecaux officially won the 20-year contract with the city to either remove or replace the current bus shelters, which were all owned by the CTA. But the contract was only for 2,175 bus shelters. JCDecaux and the Chicago Department of Transportation needed a way to evenly distribute the number of new bus shelters among wards. So, they came up with this rule: 17 percent of all existing bus stops per ward could be replaced with the new JCDecaux model. “It’s an odd number,” CDOT spokesperson Pete Scales says. It’s also a strategic number, one that ensures each ward receives a proportional amount of the new JCDecaux shelters. The new shelters were strategically placed, too. Remember: JCDecaux is an outdoor advertising company, not an architecture firm (though they did hire the world-famous American architect and current Dean of Yale’s School of Architecture, Robert A.M. Stern, to design our exclusive line of street furniture). Every piece of street furniture sports its own piece of advertising - the 2,175 bus shelters are only a part of the full JCDecaux collection, which also includes newsstand kiosks and City Information Panels. The company estimates its Chicago street furniture “network” reaches nearly 3 million residents and visitors at any given time. By 2003, the JCDecaux bus shelters began appearing on the most popular city routes in the most dense areas, Scales says. The company prioritized downtown shelters because there they would have the “most impact”: i.e. more people would see the ads. The city of Chicago was guaranteed at least $200 million dollars of profit from street furniture ad revenue. Another change in this new deal is that the CTA lost ownership of hundreds of bus shelters once the contract with JCDecaux took effect. Part of the deal was that JCDecaux maintained, cleaned, changed and managed their own advertising spaces (read: the bus shelters). It should be noted that the old shelters carried no advertising space. The fulfillment of that contract left the CTA with about 170 older shelters of its own, the ones our question-asker was curious about. That’s a big decrease from the 930-or-so shelters the CTA owned before 2003. And Jen, our question-asker, brought up a good point: The CTA shelters don’t seem to be aging well. The CTA-owned shelters don’t have a regular maintenance schedule, says CTA spokesperson Catherine Hosinski. Instead, they’re repaired on a case by case basis. So, someone has to call in to report a problem. If the problem is big enough, then the shelter is removed completely, and it’s not replaced. 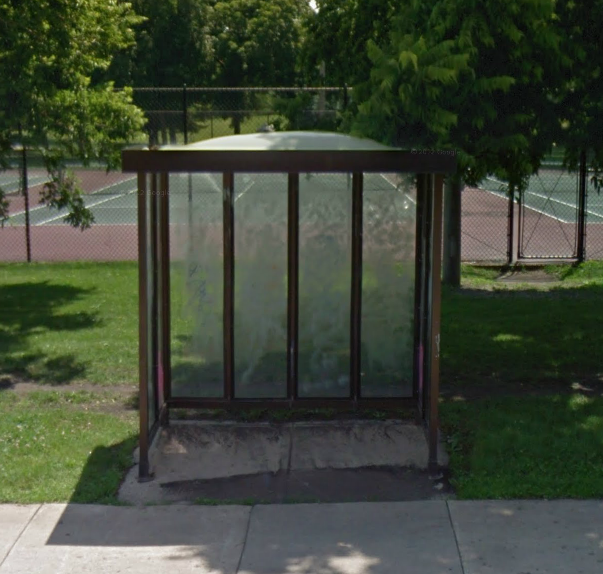 While the slightly ornate, classical-style JCDecaux shelters may be more technologically useful (many of them now have installed CTA trackers), Jen says the older shelters have something those don’t - simplicity. Ironically, the older bus shelter design is more modern than the new one. Hosinski says there’s no formal plan to phase out the older shelters. And maybe that’s a good thing. While they may be kind of an eyesore, they’re still functional eyesores. They’ll still keep you dry when it’s raining and give you shade when it’s sunny. But they’ll all have to be removed at some point; also the point at which every bus shelter in Chicago will be an advertisement itself. Logan Jaffe is a web and multimedia producer for WBEZ and Curious City. Follow her @loganjaffe and @WBEZCuriousCity.